Anthony Martin leads rival Victor Franzoni in St Petersburg. PERTH racing ace Anthony Martin opened his season in the US with a brace of flag-to-flag wins in the Grand Prix of St. Petersburg. Martin (22), of Banksia Grove, won last year’s USF2000 title, and with it, full scholarship in the Pro Mazda Championship, the next step in Mazda’s ‘road to Indy’ program. “I’m so happy to take the sweep at St Pete and to come away with the championship lead,” he said. But it was a hard-fought win, with his top rival from last year, Brazilian Victor Franzoni, in close company throughout both heats. 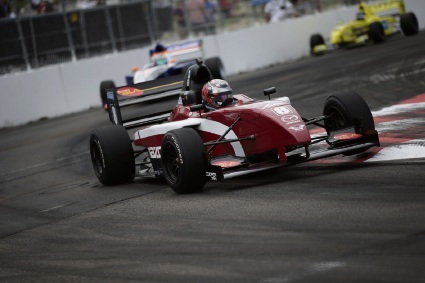 Pro Mazda cars use uprated Mazda Renesis rotary engines, which generate 195kW, about 70kW more than a USF2000 Mazda MZR powerplant – and give the cars a top speed of 260km/h. In the first race, a 25-lapper on the streets of St Petersburg, Martin took the chequered flag just 0.5084 of a second ahead of Franzoni and the second, longer event, by 1.02seconds. Martin got pole position for both races in his Cape Motorsports car, which was finished in ‘soul red’, the colour chosen by Mazda for its scholarship car. “There was a lot of pressure, but I thrive on pressure and that’s one reason we’ve done so well this weekend,” a beaming Martin said. Martin also set the fastest lap of the race, earning an additional championship point. The Pro Mazda Championship will return to action at the Indianapolis Motor Speedway Grand Prix circuit on May 12-13.